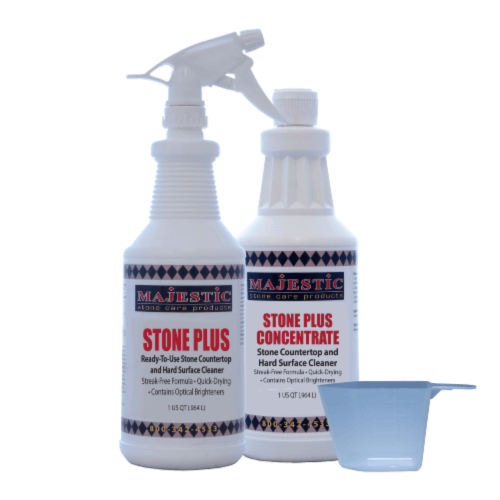 Popular STONE PLUS spray for cleaning granite countertops, marble, all stone and quartz proven very popular with consumers and pros alike in a concentrated formula for added savings and value! The Value Kit makes up to 9 quarts ($5.33/quart) for huge savings along with a superior shine! And you save on shipping costs too! Great for your pocketbook and for the environment as this new "green" version saves bottles, shipping materials, fuel and landfill impact. 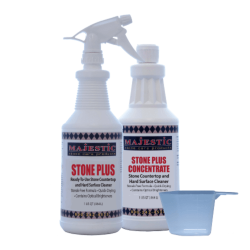 Use STONE PLUS granite and marble cleaner for general granite countertop care, marble cleaning and maintenance, travertine maintenance, on all natural stone countertops, backsplashes and for mirrors too. Recommended by This Old House Magazine. NOTE: For cleaning showers and bathtub surrounds, please see the Bath & Shower Cleaner, which is specially formulated to remove tenacious soap scum and hard water deposits that accumulate on shower walls and tile. Effective quick-drying, streak-free formula utilizes optical brighteners for a fantastic shine and color on all your granite, marble and natural stone. 1 quart / 32 oz. STONE PLUS CONCENTRATE - makes 8 quarts! I'm pleased with the stone cleaner and am confident that I am not causing any damage to the surface. It does have a pleasing smell. I don't feel like it cleans glass very well like stated in the product description and is okay on my polished nickel faucets. I ordered the Stone Plus Spray and the Soap Film Shower Cleaner and both of them work very well on my travertine. I like the sheen that the Stone plus Spray gives to my counters, and it is also nice that it can be used on mirrors and chrome; cuts down on all the products you need to buy for cleaning. When I spoke with customer service after receiving the items, they were very knowledgeable about their products and offered helpful suggestions for other questions I had about keeping marble clean and polished. I use this Stone Care "Stone Plus" cleaner on a daily basis in the bathrooms throughout my home. Not only does it clean well, but it adds a nice sheen to polished marble surfaces. The option to purchase a value kit was an added bonus. I purchased this kit in addition to the Mildew Remover and the Soap Scum Remover and The Etch Remover because recently I went to the cemetery and my son's previously beautiful marble headstone was covered in some type of fungus from the mulch that had been placed behind it and it looked absolutely horrible. I came across your site while looking for how to remove the growth and how to protect the marble in the future. I received my products very quickly and loved that I could pay through my Amazon account and didn't even have to type in my account information. When I went to the cemetery to use the products, I felt led to use the Stone Care Stone Plus Cleaner first instead of doing all of the steps that I had planned and I was absolutely amazed that the beautiful black marble looked absolutely wonderful. I used the polishing paste next sparingly as instructed and then buffed it. I was near tears when I realized I could see my reflection so well that I could apply my make-up if I wanted to. My son's headstone is absolutely more beautiful than it has ever been and I will never try another product from another company and I will recommend your product to the members in my 'grief family' so they can have the same type of experience with your products that I have. I keep a bottle of the cleaner in my car at all times and can clean my car windows at any time also. I used the other cleaners in my bathroom and was very impressed with them. I purchased your combo pack of ready to use spray and a bottle of concentrate granite and marble cleaning spray. I received two bottles of spray and no concentrate. Upon contacting you, the error was corrected and I received the bottle of concentrate virtually within a day. Outstanding service. The product is outstanding as well. I am extremely happy with the results. The counters have regained their "brand new" streakless and fogless clear shine. My wife has tried many cleaners for our granite tops and could not find anything that worked until we ran into this product. At first glance I felt it was "pricey". Guys you need to buy this product for your wife cause it does not streak and has brought back that new look lustre to our black onyx granite counters. Save your time and money on stuff that doesn't work and try this. You won't be disappointed. I bought the Stone Plus Value Kit granite/marble cleaner and am thoroughly pleased. It does not leave streaks and has a nice smell. The Stone Plus cleaner is a fantastic product that lives up well to its advertisement hype!! It's spray on application and quick removal is faster and easier than a damp cloth. It really dries very quick, leaves no streaking and the finish feels cleaner and looks brighter than using soap and water. Our granite never looked or felt better!